The ladies Tuesday Stableford was won by Lynda Pilling with an outstanding score of 45 points. This reduced Lynda's handicap from 19 to 15! Runner-up was Pat Bontoft with 32 points. Mark Latham was the winner of the men's stableford with 39 points which reduced his handicap by a shot. Runner-up was Mike Hughes with 37 points who beat Trevor Lafferty on a card playoff. There was some good scoring in the 5 club stableford on Saturday! Stephen Bury had a good score of 39 points to win the competition. Second was Steve Walsh with 38 points and Stephen Billington finished third with 37. Well done to all the winners this week! We have now fitted our new Truestrike Mats, which has been a major improvement on the facility! The feedback we have received so far has been excellent, no doubt there will be more people coming to use our driving range! The core fundamental design of TrueStrike is fiberbuilt to last and react like grass when hit, allowing golfers to have a realistic practice so they play like fairways. The TrueStrike golf mats have a "ruckable" top surface and a gel-filled divot simulating subsurface which accurately recreates the effects of playing off a natural fairway by allowing the club head to play through the playing surface as it would on turf. As I mentioned in my last newsletter I have been contacted by Mark from Night Golf regarding us hosting another event. Using LED golf balls, LED Markers, flags etc we play a team event over a 5 hole course. The Junior development programme is going extremely well and we have had a large uptake. We are gathering more and more juniors as the programme progresses and they are enjoying the sessions. The Juniors are in the process of completing their 'golf passport' which consists of the learning fundamental movement skills that are needed within golf, then progressing onto all aspects of the game. The juniors will also learn about etiquette and rules of golf, including the handicap system and different formats the game can be played in, such as stableford and medal competition. 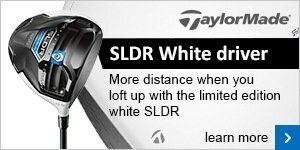 It is noticeable that lots of golfers who struggle with their wedge play have large loft gaps between their wedges. The key to playing good golf is to make it as simple as possible! Having equal loft gaps between your wedges helps you to select the right club for different distances. The majority of club golfer's carry just a pitching wedge and a sand wedge in their bag! 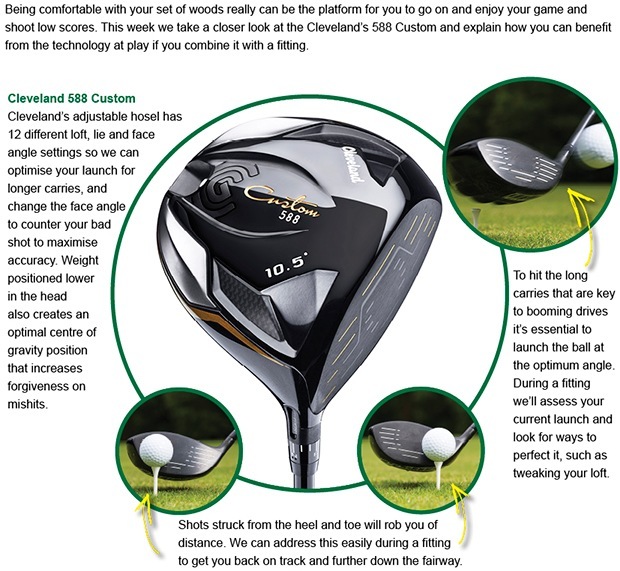 The modern day pitching wedge has roughly 46 degrees of loft which is 10 degrees stronger than most sand wedges! Introducing either a 50 or 52 degree wedge would allow the golfer to play shots in between their pitching wedge and sand wedge yardage much easier resulting in lower scores! Your professional's shop stocks Titleist, Cobra and Cleveland wedges and we have a large variety of loft and bounce combinations to help you improve your wedge play! Call the professional's shop today to book your wedge fitting! Click here to get in touch! This week we are promoting a special offer on all golf bags in store! 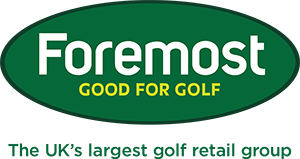 20% off all bags including brands such as Titleist, Cobra, TaylorMade, Motocaddy and Powakaddy! Keeping your equipment dry in the wet winter months is essential to play good golf! 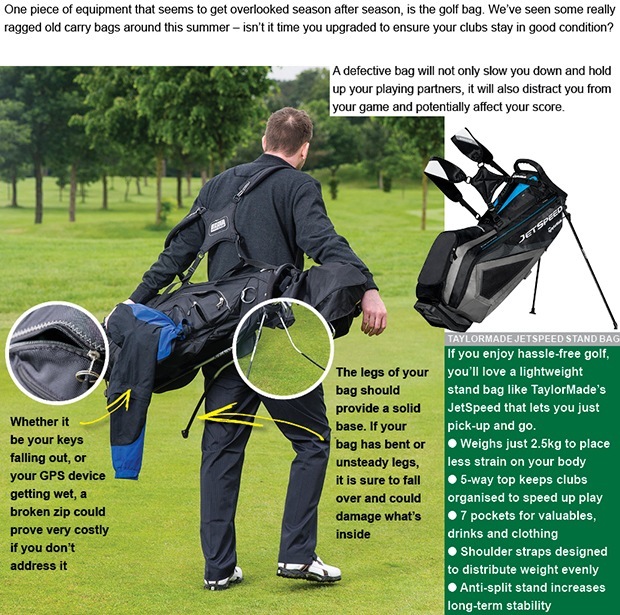 We stock fully waterproof golf bags from Cobra and Titleist that will help you to play better golf in wet conditions. The new winter UnderArmour range has landed in store! Containing a variety of garments uncluding, waterproof suits, gilets, hats, mittens, base layers and much more!